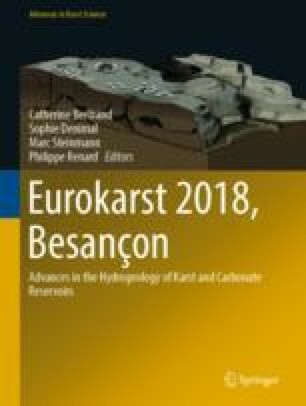 In this work, we present results of the hydrogeological, hydrochemical and isotopic studies on groundwater samples from the karst aquifer in the region of Tebessa, Northeast Algeria. The study area is characterized by a semiarid climate, with a very hot boiling, dry summer and freezing, humid winter. The karstic aquifer system that overlooks this study area is drained by a number of springs; the most important of which are those of Ain Youkous, Ain Troubia, Ain El Megalib, Ain Gaagaa and Ain Sari. They are located at different altitudes and spaced fairly large distances. The karst system has a complex functioning. The hydrochemical data (major ion geochemistry) indicate that these groundwaters are characterized by the dominance of Ca–HCO3–SO4 and Ca–Cl–SO4 water types. The main factors controlling the groundwater composition, its seasonal variations, and the rhythm of recharge are geology, because of the presence of different carbonate formations, and additionally elevation and the rate of karst development. Using stable isotope analysis data, δ18O and δ2H relationships show that all waters are meteoric in origin. The authors thank the anonymous reviewers for their constructive comments. I am grateful to the numerous people who helped me in the preparation of this paper especially laboratory of water and environment at the university of Larbi Tebessi—Tébessa. I would like also to thank sincerely both my family and friends for their encouragement and support. Conflict of Interest The author declares that she/he has no conflict of interest.